I filled the plane on arrival, they had gas, but might not the next day. I loaded all the tanks for the first time, it is unlikely I will get gas in Addis. The flight plan is easily filed the day before, and I’m set for a sunrise departure for a long flight. At the airport at six, go to the met office for weather, which looks good. No toner, so a memory briefing must suffice. Then I am taken to the plane, and get started up. The tower then says there is a problem with the flight plan. Cairo doesn’t have it yet, though I have the confirmation telex in my hand. I sit at idle for about 40 minutes, and then am given permission to taxi for 20. Then I am cleared south into Sudan, after being told to line up. I say that won’t work, so eventually I get cleared to takeoff with a short clearance about an hour late. 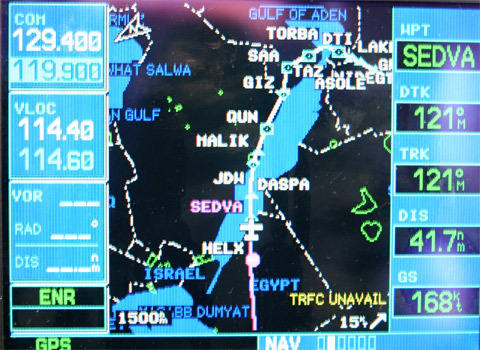 I start southeast, and am over the Red Sea quickly heading toward Jeddah, but no one knows what my routing is. I am given R775, which is fine for a while, but ends up in Eritrean airspace where I should not go. I have lost contact with my last controller, and am not sure what to do. It all works out with a very amusing looking route and some 90 degree turns, and now I’m on an airway with a high MEA, but I ask for direct to my waypoint, and I get it without a reroute. The scenery starts with some desert and mountains out of Luxor. The Red Sea is dotted with coral atolls, it must be a hazardous waterway. 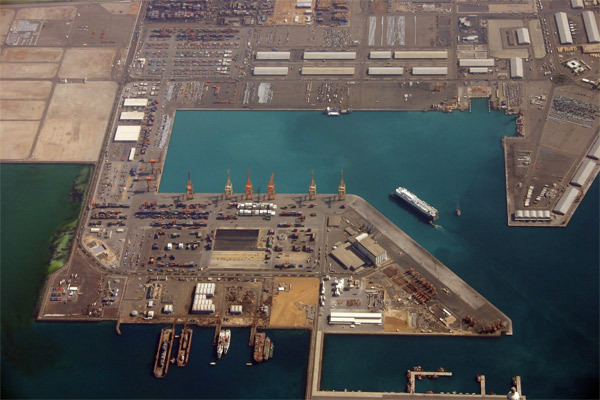 Jeddah is a very large city, with extensive shipping, and a large airport/airbase. There is a heavy haze, making pictures difficult, and later, I am above stratus clouds at 110 for much of the trip. Past the Gulf of Aden, I’m heading inland on a nearly west heading, over Djibouti, then Ethiopia. 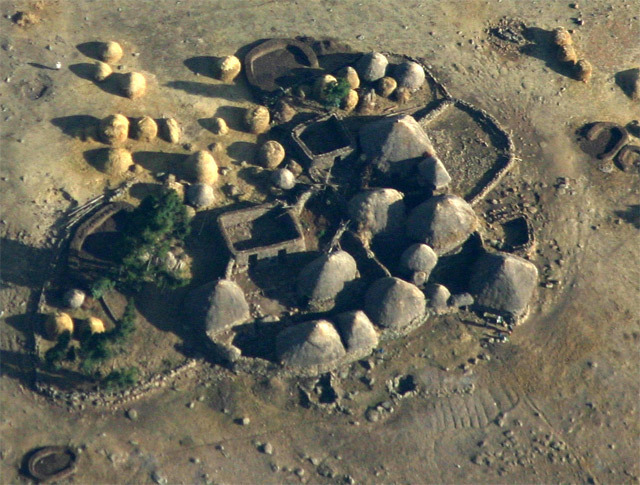 I am given an HF frequency to start with Addis, but it’s shared with Kartoum, Djibouti, and others, it’s quite hard to get heard. Then the VHF frequency picks up. I am constantly asked for my DME from waypoints, and asked to confirm altitude. There are faster higher aircraft behind me, going to the same place. For the controller, it’s easier to hold them and let me in, so I’m given number one for a full no radar VOR DME approach unlike anything I’ve ever seen, with circle to land. The approach is in the data base and everything works, and I play catch up while the plane flies itself. I have been at 160 for an MEA, and occasionally see peaks of the mountains. 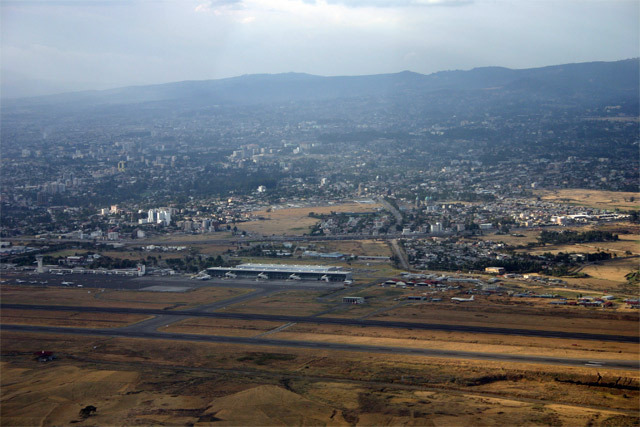 It is VFR under the clouds, Addis Ababa appears past the airport as I fly the downwind. Parking the plane is easy, near some UN aircraft. Some friendly folks give me a ride to the terminal, where I look around for customs. Out to a cab to the hotel, a sunset and some food.